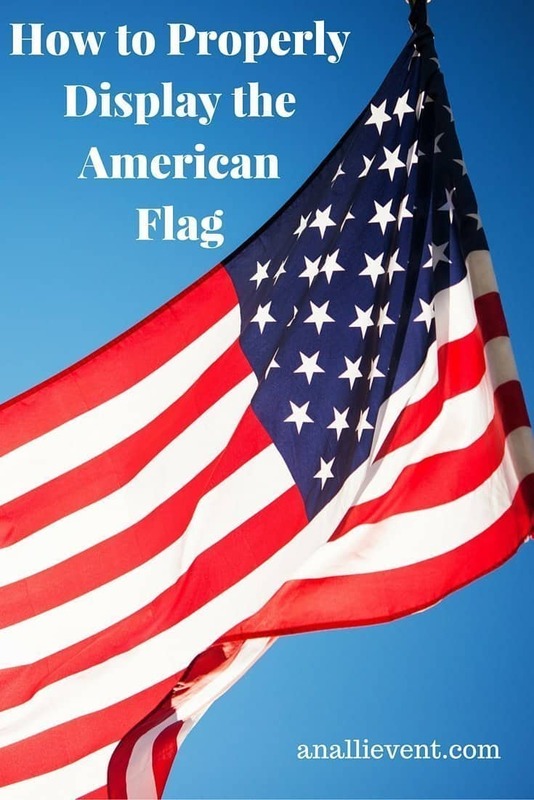 You all know how much I love to research, so several years ago when I decided to show my true patriotism by purchasing a flag to fly on my front porch, I wanted to know how to properly display the American flag at home. I wanted to show the flag the respect and honor it deserves. Plus, as my daughters will tell you, I’m a stickler for proper etiquette. I’m trying to change, but any good southern girl knows that we were born knowing that the fork was always placed to the left of the plate and the knife and spoon on the right, with the sharp edge of the knife facing the plate. (I still can’t stand to see a place setting done all wrong on TV shows). And I pinkie swear that we came out of the birth canal with a fist full of monogrammed thank you notes in one hand and a black (blue is not the proper ink color for thank up notes) ink calligraphy pen in the other hand. Getting back to the flag . . . In order to show my love for my country, you can see the importance of me wanting to know how to properly display the American flag. 1. If you are standing in front of your house looking toward your home, the flag should be displayed to your left of the front door if you are flying more than one flag. Of course, if you are walking out the front door of your house, the flag would be on your right. If you are displaying the American Flag only, either side is correct. 2. Fly the flag with the union (blue field of white stars) at the peak of the staff and always in the upper left hand corner. Flying the flag with the union down is a sign of distress. 3. 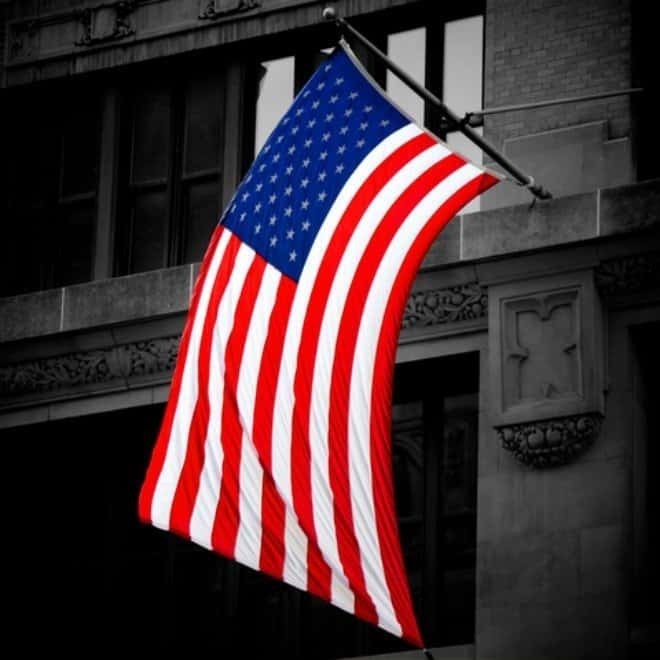 The flag can be displayed every day, but especially on holidays, including Memorial Day (half staff until noon), Flag Day (June 14) Independence Day (July 4) and Labor Day. 4. If you are displaying another flag, the American flag is always above and to the right. If you have a group of flags, the American flag is in the center and above the others. 5. In public places, such as a church or auditorium, the American flag should always be displayed to the speaker’s right. 1. Never fly another flag above the US flag! 2. Never display the flag during inclement weather (unless it’s weatherproof). 3. Never, ever let the flag touch anything beneath it, including the ground or shrubs. 4. Don’t drape the flag over cars, etc. 5. Don’t wear the flag as clothing. 6. Never draw or write on the flag. These are the main rules and regulations we should know concerning the displaying of the flag. How do I dispose of an old flag? Do you display your country’s flag at your home? Why or why not? So glad you shared this on Memorial Day! Our flag is proudly flying! I never new all these etiquette flag rules! I’m also stickler of the “correct” way to do things and I’m filing this in my memory bank!! I never knew all these etiquette flag rules! I’m also stickler of the “correct” way to do things and I’m filing this in my memory bank!! I knew I could not be the only one that is a stickler for proper etiquette! I even taught social graces as an elective to high school students for years! My grandmother would give a nod of approval for this post. She believed that every true Southern girl should have been a stickler for proper etiquette. Mine, too! I guess that’s where I get it. My daughters (20’s and 30’s) are always telling me that times, they are a-changing, but I think proper etiquette rules! 🙂 And I bet I would have loved your grandmother! This is a great post, Alli, especially for today! I see so many people disrespect the flag – it hurts my heart! My grandpa was a Marine and taught us SO many things about the flag and our country. While I do not have place to display a flag at the moment, I hope to in the future! It hurts mine, too. I wish our country would show the proper respect to the flag and to veterans like your grandpa. I know you and your family are so proud of him! I am, too. Great post Alli! Shared on all my social media. Have a wonderful Memorial Day Weekend. Thanks so much! Have a great Memorial Day! I actually didn’t know most of those tips. THanks for sharing! Have a great day! You’re welcome! Have a beautiful day! We followed lots of “dont’s” because the only place to fly our flag was to the right of the front door, but it was the only spot where it would fit. I love our flag – it was my dad’s who was a WWII Purple Heart Veteran. Happy Memorial Day! How great that it was your dad’s flag and to the right of the front door is fine. And a Purple Heart? I know you are so proud of your dad. Have a wonderful day! Great post! Well, I do not display my country’s flag. I am a resident of Germany, but was not born there and do not live there. I liked all the places we have lived, including the States, but I do not have the sense of belonging. Looking forward to my Heavenly permanent home. Happy Memorial Day, Alli! Thanks, Anna! I’ve visited other countries, but have only lived in the USA. I bet you have learned a lot during all of your adventures. I’m a little envious. 🙂 I look forward to my permanent, heavenly home, too. We display the flag year round. My hubby wouldn’t have it any other way. Our flag proudly waves outside our front door every day. My husband takes in at night, but puts it out as soon as he gets ups. He was in the Army so he displays it correctly. Happy Memorial Day! I’m sure I could learn a few things from your husband! Tell your husband thanks for serving to protect our freedom! I get all choked up when I think about all the men and women (and their families) that have sacrificed so much for our country. We do fly our flag year round on a post designed for that from our front porch. It is a weather proof flag which my husband replaces when needed. He likes for it to look fairly new all of the time. I’m glad you posted the Pledge! Mine is water proof, too. 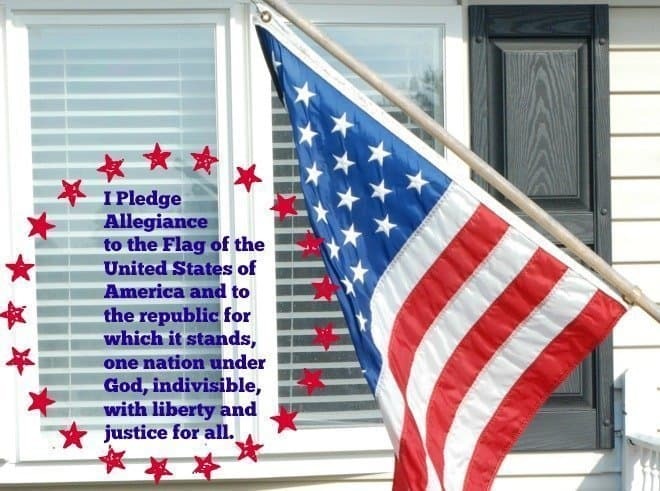 Love our flag (and the pledge). Thanks, Dee! I love my country and hold our servicemen and women in such high esteem. God bless America! So nice to seek out somebody with some original ideas on this subject. realy thanks for starting this up. this website is something that’s wanted on the web, somebody with a bit of originality. useful job for bringing something new to the internet!